I had a last minute decision in all my wisdom to change islands. I was so tired yesterday, I didn’t get tickets, I didn’t pack my bag or get organised in any way, shape or form. This morning when my alarm went off at 5:45am I was less than enthused…. I rushed around after lolling in bed too long, jumping into the world’s quickest shower, throwing my stuff into my bag (deciding today was the day to get rid of my dying walking boots as there wasn’t a lot of space), checking out and practically running to the sea front with my 13kg backpack in 26° heat to try and get a ticket. Safe to say I was melting by the time I got to a ticket office, they took one look at me and said no. I asked in my best Spanglish for a ticket for today to Santa Cruz and they just repeated no and tomorrow…..dammit! Determined that I was not walking my backpack back up that hill out of town I went to the dock. I flailed around with my bags looking for someone to ask about a ticket. I asked one of the ladies checking the baggage, but my Spanglish was not being clear and she started to try and take my bags to check. I repeated again and before I knew it she had called over a policeman – great! I was going to get escorted off the docks for trying to sneak aboard…..just my luck! The policeman looked at my tomato red face, my flustered grasp on my bags and my attempted pitiful Spanglish (it was before 7am….I cut myself a little bit of slack!) and walked me straight over to a gentleman​ selling tickets. I could have bear hugged them both!!!! 5 minutes later, I had a ticket, my bags had been checked and I was standing looking at my favourite view – the seafront and the cheeky sea lions. 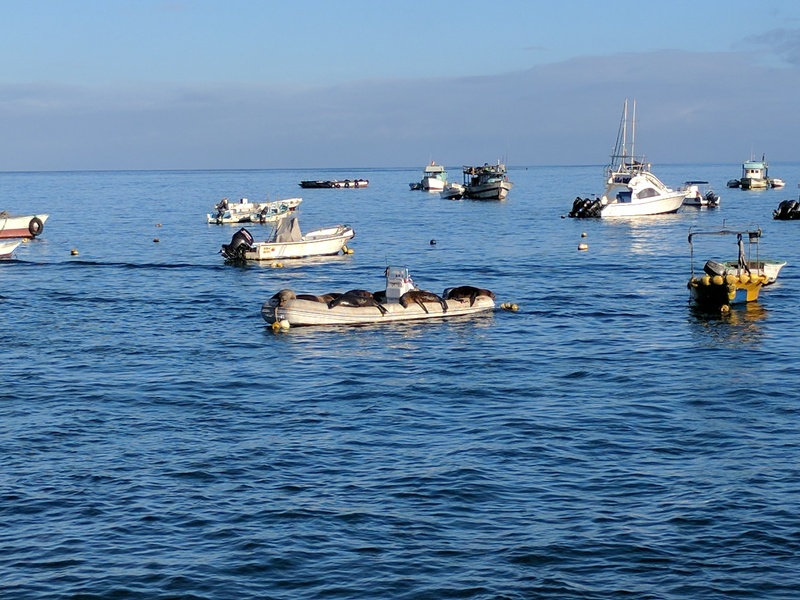 Today a number of them had found a boat to sleep on. To get onto the boat to Santa Cruz you were called by name and escorted to the boat. No stowaways here! With my tardiness to get a ticket I was the last to be called…of course….and so had no choice on where I would like to sit. I was allocated the best seat on the boat. One of four seats at the top. A brilliant view where I could get the sun, have the wind fly through my hair and enjoy every minute. Awesome! I settled myself in excitedly waiting to leave. I was having a great time until about an hour in….I was convinced I felt a few raindrops. A few minutes later I KNEW I felt raindrops as the heavens fully opened. Suddenly this didn’t seem the best seat on the boat….An hour of constant heavy rain and I was soaked to the skin and shivering to my core. My hand bags were forming pools and the taxi boat to the shore seemed to take an eternity. Sadly at the shore the rain wasn’t any less….I know not likely, but I was ever hopeful! You can’t blame a girl for hoping. I stood at the shore soaked through, dripping, shivering and undecided what I should do. Should I wait for the next ferry (another four hours) and head on to Isabela island? Ultimately that was where I was heading and in this rain it’s not like I could do anything in Santa Cruz today….Or should I go and get warm and dry and chill out in a hotel room somewhere here? The shivering won out. I could almost feel my ‘nearly sore throat’ yelling at me to go and get dry before I got sick. I trudged up the road, found the nearest hostel/hotel and asked for a room not caring about the state of it or price at this point. I was making a puddle in their reception, so after laughing, I think they just wanted to move me on. In my room I started on damage control. The room was a state within seconds. I poured everything out trying to find hanging space to get my bags drying, I stripped to a towel to get my clothes drying, I found space to put my shoes to drip quietly and hopped in the shower to warm up. As soon as I got into fresh clothes I headed to the supermarket for snacks and water supplies. I made a few calls to loved ones as I hadn’t checked in in a while and then I decided I would go and buy my ticket to travel to Isabela tomorrow. Feeling organised I sat and ate, headed back to the room, got packing my gear (I WAS going to be more organised than today) and decided to have a little pamper to feel a bit more refreshed. It’s a shame I can’t reach the sunburn on my back to make that feel refreshed! Fingers crossed for better weather tomorrow…. I’m not sure my stuff can survive another soaking!! !